* The ≈ symbol indicates that the two items are similar, but not equal, to each other. Hacker is a disputed term. The word hacker is so often mis-applied to describe law breaking, information theft, privacy violation, and other black-hat activities that the mistake has become permanently installed in our lexicon. I am not using hacker in this sense of the word. To be clear: when I use the word hacker and when I write about hacker values, I am not referring to computer criminals and their sketchy value systems. Instead, I am using hacker in its original meaning: a person who makes clever use of technology and information to solve practical problems. With the current popularity of hackerspaces and makerspaces in libraries, library hack-a-thons, and hacking projects for librarians; it is clear that library culture is warming to the hacker ethic. This is a highly positive trend and one that I encourage more librarians to participate in. The reason I am so excited to see libraries encourage adoption of the hacker ethic is that hackers share several core values with libraries. Working together we can serve our communities more effectively. This may appear to be counter-intuitive, especially due to a very common public misconception that hacker is just another word for computer-criminal. In this post I want to correct this error, explain the values behind the hacker movement, and show how librarians and hackers share core values. It is my hope that this opens the door for more librarians to get started in productive and positive library hackery. First, a working definition: hackers are people who empower themselves with information in order to modify their environment and make the world a better place. That’s it. Hacking doesn’t require intruding into computer security settings. There’s no imperative that hackers have to work with code, computers, or technology–although many do. Besides the traditional computer software hacker, there are many kinds of crafters, tinkerers, and makers that share core the hacker values. These makers all share knowledge about their world and engage in hands-on modification of it in order to make it a better place. For a richer and more detailed look into the hacker ethic than provided by my simplified definition I recommend three books. First try Corey Doctorow’s young adult novel, Little Brother 1. This novel highlights the hacker values of self-empowerment with information, hands-on hacking, and acting for the public good. Little Brother is not only an award-winning story, but it also comes with a bibliography that is one of the best introductions to hacking available. Next, check out Steven Levy’s classic book Hackers: Heroes of the Computer Revolution 2. Levy details the history of hackers in the early 1980s and explains the values that drove the movement. Third, try Chris Anderson’s Makers: The New Industrial Revolution 3. Anderson tells the story of the contemporary maker movement and the way it is combining the values of the traditional do-it-yourself (DIY) movement with the values of the computer hacker community to spark a vibrant and powerful creative movement across the world. It was a philosophy of sharing, openness, decentralization, and getting your hands on machines at any cost to improve the machines and improve the world. Engaging in the Hands-on Imperative. Once we understand that hacking is rooted in the core values of sharing, openness, collaboration, and hands-on activity; we can begin to see that hackers and librarians share several core values and that there is a rich environment for developing synergies and collaborative projects between the two groups. If we can identify and isolate the core values that librarians share with hackers, we will be well on our way to identifying areas for productive collaboration and cross-pollination of ideas between our cultures. If we are going to compare hacker values with library values, an excellent starting point is the American Library Association’s Library Bill of Rights. I recently had the pleasure of attending a keynote presentation by Char Booth who made this point most persuasively. She spoke eloquently and developed a nuanced argument on the topic of the narratives we use to describe our libraries. She encouraged us to look beyond the tired narratives of library-as-container-of-information or library-as-content-repository and instead create new narratives that describe the enduring concept of the library. This concept of library captures the values and services libraries provide without being inextricably linked to the information containers and technologies that libraries have historically used. As she developed this argument, Char encouraged us to look to library history and extract the core values that will continue to apply as our collections and services adapt and change. As an example, she displayed the 1948 Library Bill of Rights and extracted out of each paragraph a core value. Her lesson: these are still our core values, even if the way we serve our patrons has radically changed. 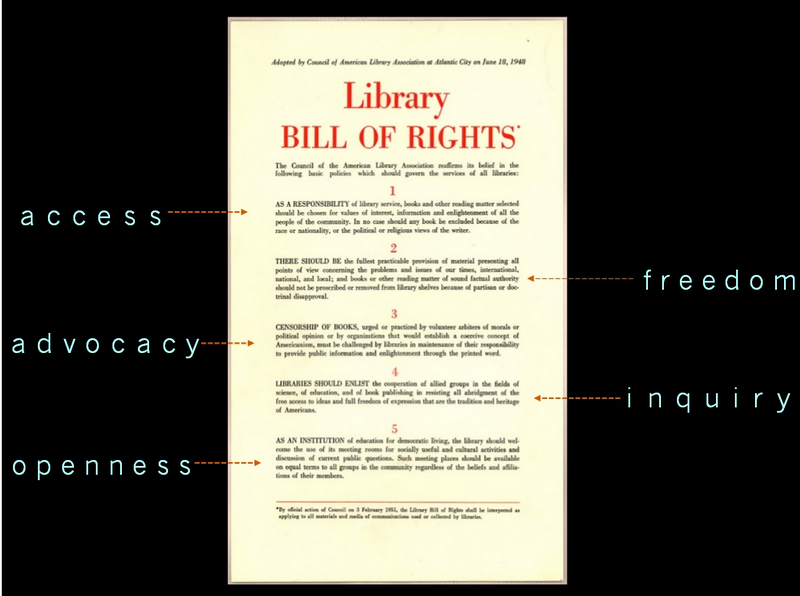 Char distilled the Library Bill of Rights into five core values: access, freedom, advocacy, inquiry, and openness. If we compare these values with the hacker values from above: sharing, openness, collaboration, and the hands-on-imperative, we’ll see that at least in terms of access to information, public openness, freedom, sharing, and collaboration libraries and hackers are on the same page. There are many things that hackers and libraries can do together that further these shared values and goals. It should be noted that hackers have a traditionally anti-authoritarian bent and unlike libraries, their value of open access to information often trumps their civic duty to respect license agreements and copyright law. Without trivializing this difference, there are many projects that libraries and hackers can do together that honor our shared values and do not violate the core principles of either partner. After all, libraries have a lot of experience doing business with partners who do not share or honor the core library values of freedom, openness, and access to information. If we can maintain productive relationships with certain parties that reject values close to the heart of libraries and librarians, it stands to reason that we can also pursue and maintain relationships with other groups that respect these core values, even as we differ in others. At the end of the day, library values and hacker values are more alike than different. Especially in the areas of library work that involve advocacy for freedom, openness, and access to information we have allies and potential partners who share core values with us. If my argument about library values and hacker values has been at all persuasive, it raises the question: what do hacker/library partnerships look like? Some of the answers to this have been hinted at above. They look like Jason Griffey’s LibraryBox project. This wonderful project involves hacking on multiple levels. On one level, it provides the information needed for libraries to modify (hack) a portable wifi router into a public distribution hub for public domain, open access, and creative-commons licensed books and media. LibraryBoxes can bring digital media to locations that are off the net. On another level, it is a hack of an existing hacker project PirateBox. PirateBox is a private portable network designed to provide untraceable local file-sharing. Griffey hacked the hack in order to create a project more in-line with library values and mission. These partnerships can also look like the Washington DC public library’s Accessibility Hack-a-Thon, an ongoing project that brings together, civic, library, and hacker groups to collaborate on hacking projects that advance the public good in their city. Another great example of bringing hacker ethics into the library can be found in TechConnect’s own Bohyun Kim’s posts on AJAX and APIs. Using APIs to customize web services is a perfect example of a library hack: it leverages our understanding of technology and empowers us to customize and perfect our environment. With an injection of hacker values into library services, we no longer have to remain at the mercy of the default setting. We can empower ourselves to hack our way to better tools, a better library, and a better world. An excellent example of hackery from outside the library community is Audrey Watters’ Hack Education and Hack [Higher] Education blogs. Just as computer hackers use their inside information of computer systems to remake the environment, Audrey users her inside knowledge of education systems to make positive changes to the system.